Draft: 2014, Detroit Tigers, 2nd rd. Resides in Madison, MS during the offseason...Compiled a 5-7 record with a 2.22 ERA (93.1IP/23ER) in 15 starts as a junior at the University of Alabama in 2014...held opponents to a .192 batting average, allowing only 61 hits in 93.1 innings pitched...Participated in the Tigers Winter Caravan and TigerFest...Recommended/signed by Bryson Barber for the Tigers. Made 21 starts between Double A Erie and Triple A Toledo in 2018…also saw the first Major League action of his career, appearing in four outings, including three starts with the Tigers...Earned Eastern League Pitcher of the Week honors twice during the season…his first award came for the week ending May 13 when he had a 2-0 record and threw 11.0 scoreless innings with 12 strikeouts, while the other came for the week ending June 10 when he tossed 12.2 innings, striking out 14 and giving up three runs...Threw a shutout for Erie on June 10 vs. Reading, allowing just four hits and striking out a season-high 11 batters…the shutout was the first of his career, while it was his second complete game (other, May 31, 2015 at Fort Wayne as a member of Single A West Michigan)...Sidelined from June 21-July 21 with a right rotator cuff strain... Struck out 11 in his debut for Toledo on August 27 vs. Columbus, allowing three runs in 6.1 innings...Made his Major League debut on September 14 at Cleveland, throwing a perfect inning in relief with one strikeout…struck out Yan Gomes for his first Major League strikeout...Recorded the first quality start of his Major League career on September 25 at Minnesota, allowing one run on six hits with one walk and five strikeouts in 6.0 innings...became the first Detroit pitcher to throw 6.0-or-more innings and allow one run-or-less in one of his first two Major League starts since Kyle Ryan tossed 6.0 shutout innings in his Major League debut on August 30, 2014 at Chicago (AL). Combined to make 21 starts between the GCL Tigers West, Single A Lakeland and Double A Erie in 2017 ... Sidelined from May 23-July 9 with right elbow tendinitis ... Allowed three runs-or-less in eight consecutive starts with Lakeland from May 16-August 11...compiled a 5-1 record with a 1.50 ERA (48.0IP/8ER) and 41 strikeouts over the eight-start stretch ... Made six starts with the Mesa Solar Sox in the Arizona Fall League, going 2-2 with a 3.74 ERA (21.2IP/9ER) and 19 strikeouts. Limited to 12 starts between the GCL Tigers East, GCL Tigers West and Single A Lakeland in 2016 after missing most of the season due to injury ... Sidelined from April 7-August 4 with a right shoulder strain ... Posted a 1-3 record with a 3.60 ERA (20.0IP/8ER) and 20 strikeouts in six starts with the Salt River Rafters in the Arizona Fall League ... Ranked as the 19th-best prospect in the Tigers organization by Baseball America following the season. Made a career-high 22 starts and won a career-best 11 games with Single A West Michigan in 2015 ... Named to the Midwest League Midseason All-Star Team and recognized by MiLB.com as an Organization All-Star ... Ranked tied for seventh in the Midwest League with 11 victories...ranked fourth among Midwest League starting pitchers with a .242 (106x438) opponents batting average, while he was fifth with 8.18 strikeouts per nine innings ... Began the season with a streak of 12 consecutive starts of three-or-fewer earned runs allowed from April 11-June 28...went 5-2 with a 2.80 ERA (61.0IP/19ER) and 52 strikeouts during the stretch ... Struck out a season-high 12 batters and threw 6.2 scoreless innings on September 1 at Great Lakes ... Ranked as the ninth-best prospect in the Tigers organization and the 17th-best prospect in the Midwest League by Baseball America following the season. 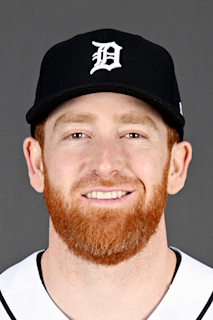 Completed his first season of professional baseball in 2014, starting 12 games between the GCL Tigers and Connecticut Tigers ... Started five games during the month of July with Connecticut, going 0-1 with a 3.86 ERA (11.2IP/5ER) and six strikeouts ... Ranked as the 18th-best prospect in the Tigers organization by Baseball America following the season. September 11, 2018 Detroit Tigers recalled RHP Spencer Turnbull from Toledo Mud Hens. August 25, 2018 RHP Spencer Turnbull assigned to Toledo Mud Hens from Erie SeaWolves. July 26, 2018 RHP Spencer Turnbull assigned to Erie SeaWolves from Lakeland Flying Tigers. July 21, 2018 RHP Spencer Turnbull assigned to Lakeland Flying Tigers from Erie SeaWolves. July 16, 2018 Erie SeaWolves sent RHP Spencer Turnbull on a rehab assignment to GCL Tigers West. June 22, 2018 Erie SeaWolves placed RHP Spencer Turnbull on the 7-day disabled list. March 9, 2018 Detroit Tigers optioned RHP Spencer Turnbull to Erie SeaWolves. November 20, 2017 Detroit Tigers selected the contract of Spencer Turnbull from Erie SeaWolves. August 16, 2017 RHP Spencer Turnbull assigned to Erie SeaWolves from Lakeland Flying Tigers. July 9, 2017 Lakeland Flying Tigers activated RHP Spencer Turnbull from the 7-day disabled list. June 27, 2017 Lakeland Flying Tigers sent RHP Spencer Turnbull on a rehab assignment to GCL Tigers West. May 23, 2017 Lakeland Flying Tigers placed RHP Spencer Turnbull on the 7-day disabled list. August 4, 2016 RHP Spencer Turnbull assigned to Lakeland Flying Tigers from West Michigan Whitecaps. July 21, 2016 West Michigan Whitecaps sent RHP Spencer Turnbull on a rehab assignment to GCL Tigers West. June 30, 2016 West Michigan Whitecaps sent RHP Spencer Turnbull on a rehab assignment to GCL Tigers East. June 25, 2016 West Michigan Whitecaps sent RHP Spencer Turnbull on a rehab assignment to GCL Tigers West. April 7, 2016 RHP Spencer Turnbull assigned to West Michigan Whitecaps from Lakeland Flying Tigers. April 2, 2016 RHP Spencer Turnbull assigned to Lakeland Flying Tigers from West Michigan Whitecaps. April 4, 2015 RHP Spencer Turnbull assigned to West Michigan Whitecaps from Connecticut Tigers. June 27, 2014 RHP Spencer Turnbull assigned to Connecticut Tigers from GCL Tigers. June 19, 2014 RHP Spencer Turnbull assigned to GCL Tigers. June 17, 2014 Detroit Tigers signed RHP Spencer Turnbull.